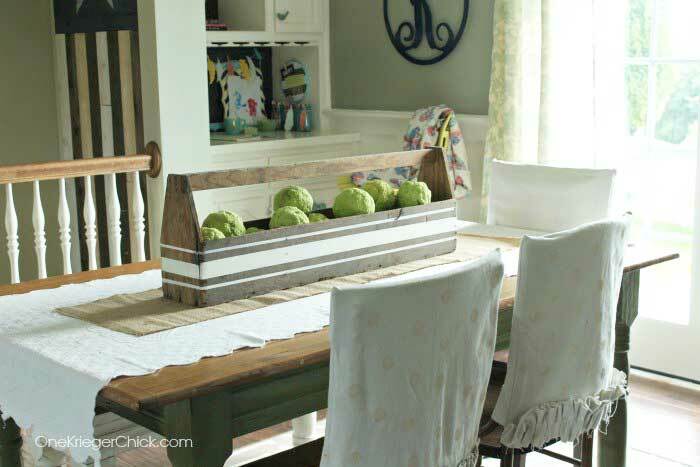 An old wooden toolbox could be the best thing for your kitchen table! It may not seem like the two would go together but a toolbox makes a great base for a centerpiece. The toolbox can be left natural or lightly painted for a rustic chic look. To give you some inspiration, I have come up with several examples of these type of centerpieces. 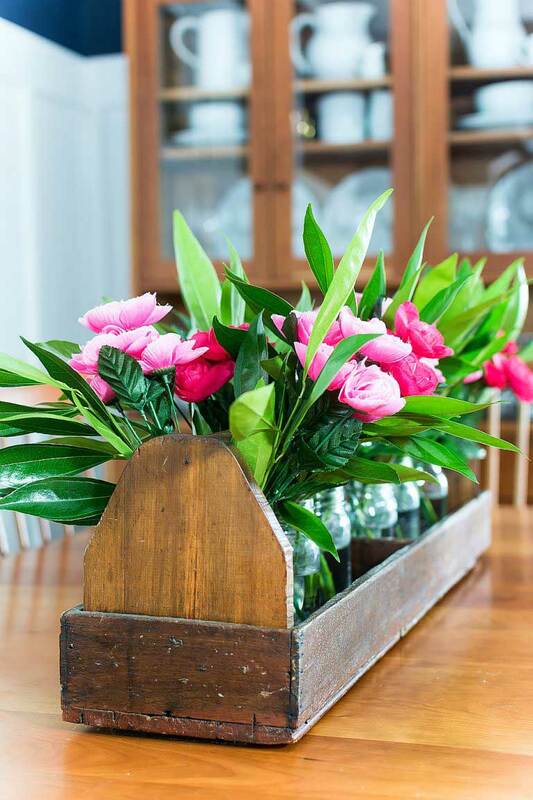 A summer centerpiece can be as simple as adding fresh flowers to the wooden toolbox. For a soft chic look, just add white flowers. If the base is a light natural color or painted white, it adds to the chicness. 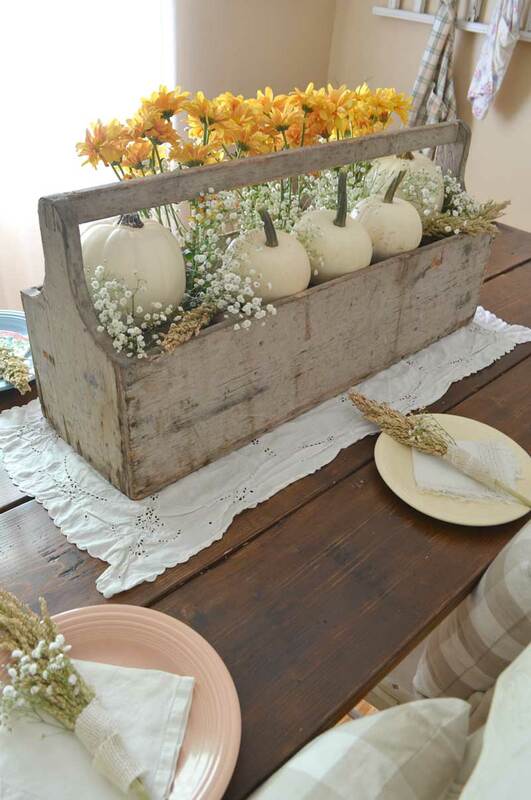 This first toolbox centerpiece is a good example of simple rustic chic. For a more vibrant look you could use bright flowers and leave the toolbox natural. 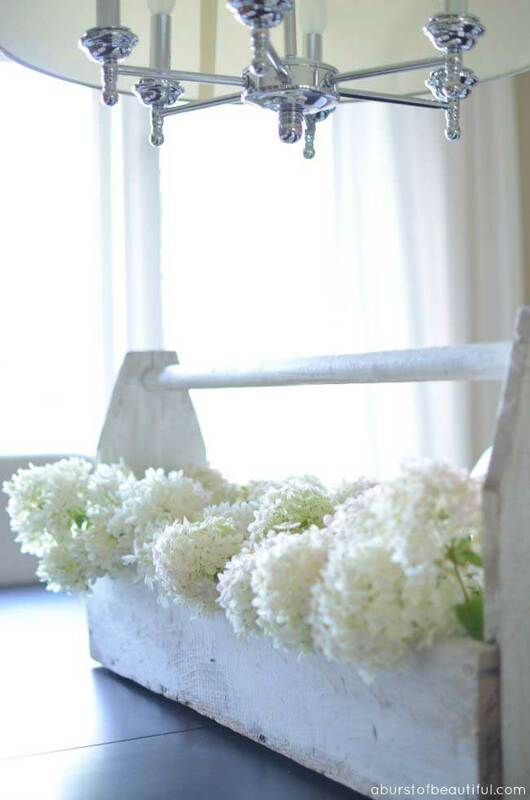 Using mason jars as vases for the flowers is another nice touch for this toolbox centerpiece. Fall is a great time to display pumpkins or gourds. Why not combine them in a wooden toolbox for a more rustic look? The flowers and baby’s breath complete the look of this festive fall centerpiece. I love the natural rustic look of all of these toolboxes. If you do want to add a little more interest, you can also paint stripes instead of painting the whole toolbox. I’m liking how this next toolbox has stripes that remind you of a grain sack. This grain sack painted toolbox is fresh and very rustic chic. Since fresh flowers aren’t usually available in the winter, plants are a perfect filler for a winter toolbox centerpiece. 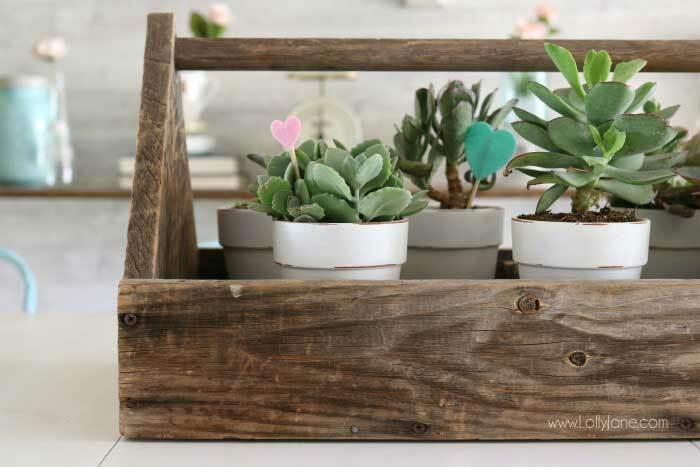 Succulents make a great choice like you see in this Valentines Day centerpiece. The little heart picks were added for a festive touch. Other good options for winter centerpieces are to fill the toolbox with poinsettias or little Christmas wrapped boxes.